Mihaela is a Lecturer in Digital Media Culture, where she teaches on the Global Media Management MA programme and leads the Digital Cultures option module. 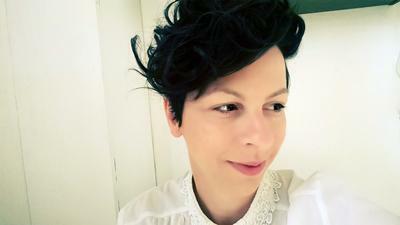 Mihaela is a screen and film studies researcher and curator. Her AHRC-funded PhD research was carried in the Media and Communications department at Goldsmiths, University of London and focused on moving images, media and technology in recent history and contemporary Romanian critical art practice. She has an MA in Film and Screen Studies and a PGCert in Teaching and Learning in Higher Education, both from Goldsmiths, University of London. Prior to her current role, she was Visiting Lecturer in Screen Histories at University of Brighton and Associate Lecturer at Goldsmiths, University of London. Mihaela is interested in screen studies, film theory, media archaeology, aesthetic theory, the politics of the audiovisual, feminist practices with moving images, the cultural production of subjectivity in contemporary technologically mediated contexts, historiographies and critical uses of archival images in academic and artistic practice. She also reflects in her work on gender, performance and interventions exploring the private and public configurations of media, space, memory, and the possibilities of collective work. Brebenel, M., Collier, C., & Figiel, J. (2014). The Artist as Interlocutor and the Labour of Memory. In The Postcolonial Museum: The Arts of Memory and the Pressures of History (pp. 89-99). Farnham: Ashgate Publishing.